Common sense will tell you that there are some locations that are just not suitable for your vegetable garden. To position your garden on a very steep slope, boggy area or to position it in an area that is likely to flood is not wise. As is to position it in shady or too far away from a supply of water. It is far better to choose a position in full sun for your vegetable garden, a position that is sheltered or can be protected from drying winds, and of course, a site that is free from weeds or debris would be nice too. Try not to position your vegetables any closer than ten to twenty metres away from large tree roots. 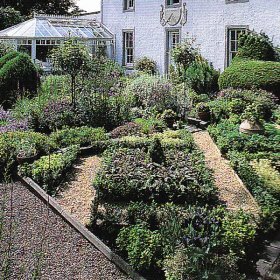 Planting herbs and vegetables in clumps and rows as a mixed bed looks really attractive when edged with either willow or hazel hurdles, creating a rustic, old fashioned style of garden. Your vegetable garden can be any shape or size, but the most practicable shapes are squares and rectangles, for differing ranges of vegetables with different needs as well as differing growing seasons. Sizes of vegetable gardens will be dependent on your vegetable needs as well as the overall size of your garden itself. When walking on soil, you compact it, which means that water will not drain away so easily. Even though plants need water, they do not like to be waterlogged. water from pasta or vegetables over them. An often asked question is, is it better to grow vegetables in a bed, or in rows. It really just depends upon your style and size of garden. Many gardeners divide their gardens into square or rectangular garden beds. Each bed should not be more than 1,2 meters wide so that you can reach the middle of each bed without stepping on the soil. They should also be separated by paths about thirty centimetres wide. When growing large quantities of vegetables you may prefer to grow plants in long straight rows, grouping them by type. With this style of planting it is not so easy to work without stepping on the soil, so use planks to walk on when accessing you plants.